June 20, 2015 found 40 Rwandan refugees who returned to Rwanda from the Congo attending an outdoor Mirror Therapy workshop led by ETPP Rwanda representative, Jean Luc Ngarambe at Bisesero Village, a refugee camp. Enthusiasm to learn the effective Mirror Therapy procedures was very high among the 20 amputees and their 20 family members. Many questions were posed and were able to be answered by the ETPP representative, who is a certified physiotherapist. Amputees said that they appreciated this practice to reduce pain because though they feel phantom limb pain, when they explain their pain to clinical health providers, none understand phantom limb pain. Often they return home without any treatment. 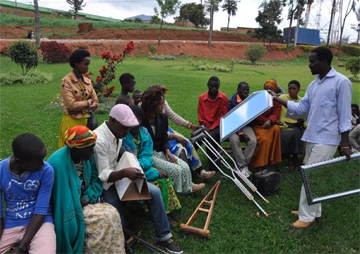 They also realized the importance of teamwork in helping the amputee practice Mirror Therapy to reduce the phantom limb pain. 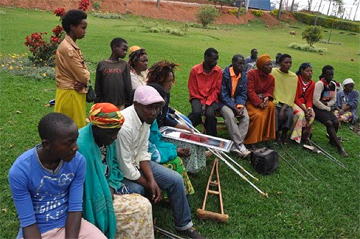 This Mirror Therapy workshop for amputees is the second successfully conducted by Ngarambe at Rawandan refugee camps.